KJS: Greetings Andy! You're the Lead Vocalist and guitarist with The ELO Experience. Where did your musical journey take you before you joined the band? AL: For many years I performed with different bands and even on my own in the Northern Club Circuit. I was also an Elvis impersonator for a while! KJS: How did you become a part of The ELO Experience? AL: After performing in clubs I wanted to do something different without leaving music, which I loved. I have always loved ELO and grew up with the songs. No-one was doing a tribute to ELO and Jeff was not touring it seemed an obvious move. I contacted a few guys who I knew very well and were incredibly talented and we took it from there. KJS: The ELO Experience have a growing legion of followers both on-line and at your concerts. How important are those fans to you? AL: The fans are as important as it gets to us. We are so lucky in that for a very short time on stage we get to feel how Jeff and the boys must have felt. The people who come to our shows are the best. They make us feel great and I can personally feel the joy they get from this great music and that pushes me and the rest of the band on to make sure we give everything we have every time. We are a tribute show to Jeff and ELO and no more. I am humbled by the great and loud reception we receive everywhere we perform the show. We are genuinely trying to be as respectful as we can to the great man and his superb band and take nothing and no-one for granted. We are very lucky! 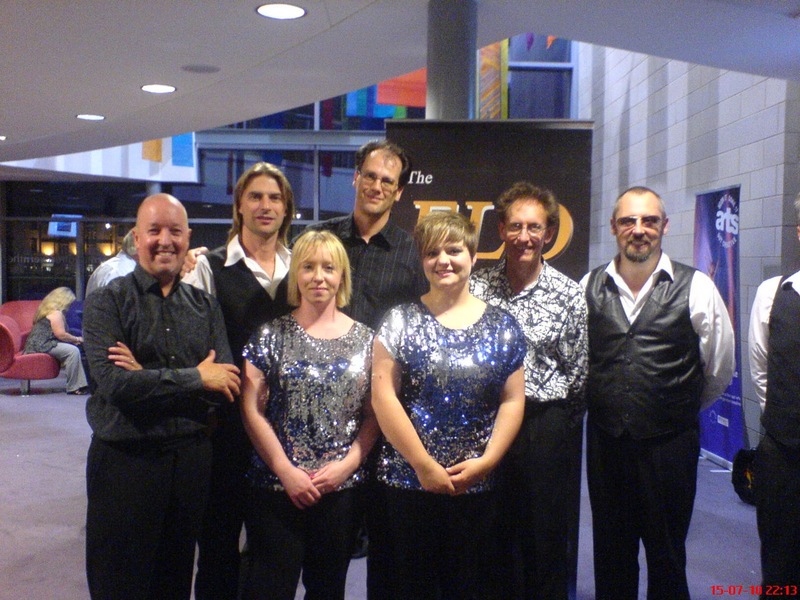 KJS: The ELO Experience are currently your good self, Steve Hemsley [Keyboards/Special Effects/Vocals], Pete Johnson [Bass Guitar/Vocals], Jan Christiansen [Lead Guitar/Vocals], Tony Lawson [Drums/Percussion], Viv Blackledge [Cello] and Marissa Steer [Cello]. Can you tell us about the mechanics of the band and the personalities? AL: When working so closely with people, especially talented and artistic people, can be sometimes testing, however I can honestly say that we, as a group get on superbly and that is key in my opinion to having a successful show. We all have our roles to play and no single one is more or less valuable than the other, we rely on each other and all know what is expected after all we are professional musicians and have to do what it takes. We have just had to make a change in our line up. Pete Johnson who has been superb over the last 18 months since he joined "The ELO Experience" has had to leave due to other commitments. This is sad for us as Pete is a great guy as well as a talented band member. We have searched and found a great replacement for Pete and YES it is another Pete; this time 'Smith'! We have known Pete [#3] for a long time and he has worked with the show from time to time initially when Pete Allison was very ill and again when Pete Johnson was ill. He will be a great addition and we are looking forward to the future. As for personalities what you see is basically what you get. We all love what we do and do not take our selves too seriously. Our feet are well and truly on the ground. KJS: We were all shocked when Pete Allison passed away within a few weeks of ELO's Kelly Groucutt. How did these twin blows affect the band? AL: Pete A was a great musician and superb ambassador for our show but to me and all the other members he was our friend first and foremost. His illness and passing hit all of us so hard and was almost the end for the show. If it had not been for the feeling of letting Pete down we probably would have walked away - this is how low we got. But in true Pete style we picked ourselves up! He is still with us in many ways and there is not a time when we do not think and talk about our time with him, we were blessed to know him. Kelly was a shock and I thought someone was playing a sick joke when I received a text message saying he had died. I only met him a few times but he was always very complimentary to the show and had no edge to him. I just wish we had got to know him better. He came across as a fun loving, warm and genuine man. We miss them both incredibly. KJS: What are your musical influences besides ELO? AL: All the band members have their own heroes and favourites. The common ones are The Beach Boys, The Beatles and any great harmony bands. I was brought up with the sound of Elvis in my ears for many years and I am a massive fan. Someone we admire from today's music would probably be Michael Buble. KJS: Do you have any other musical projects ongoing and, if so, what are they? AL: Nothing at present. We are very busy developing our show and reputation with The ELO Experience! KJS: Your set list includes a wide range of the ELO songs would you like to recreate on stage and/or do you plan to perform in future? AL: We try to put a new 'album' song in once a year just to add some freshness to the show. Last year it was "Big Wheels" from "Out Of The Blue" and this year it is "Standin' In The Rain", also from OOTB. Songs for the future. Well, there are so many that I like! "So Fine" and "Four Little Diamonds" are amongst the 50 or so others I would like to do! I would like the band to get to the stage where we can re-create the full OOTB album [or most of it anyway]! KJS: How difficult is it to reproduce those very multi-layered and unique Jeff Lynne compositions and orchestral ELO arrangements on stage? AL: For me impossible, however Steve Hemsley is probably the most gifted musician I know and he works extremely hard on getting every little detail correct. The task is obviously made a great deal easier when you work with gifted and willing people. We work together and if something is not right, we are in an environment where it is said as it is and no one gets upset. The end result of the show is all important and the finished result has to be no less than the best it can be - after all people pay good money to see the show and deserve only the best we can offer. Being a tribute band means we cannot cut corners - we must deliver as near as we can to the record! After all, this is what the majority of people remember. KJS: A question I always ask next ... What are your personal favourite ELO tracks? AL: As I have said previously I love "So Fine" and "Four Little Diamonds" but I genuinely love most of them. Some I find difficult to sing - as Jeff had a unique and great voice - songs such as "Ma Ma Ma Belle" and "10538 Overture" for example. We tried these and did not feel we could do them justice. We have worked on "It's Over" and "The Way Life Meant To Be" which are also great songs - but I love 'em all! KJS: How can folks find out where and when The ELO Experience are playing? KJS: Finally ... Has Pete Johnson now recovered from being "cut ‘orf" in that infamous July 2010 photograph at Shrewsbury? AL: Yes he has - just! This was NOT the reason for him leaving - 'onest! Many thanx to Andy for participating in this interview. ELO Beatles Forever [ELOBF] recommends The ELO Experience to those enlightened folks who enjoy the music of ELO, Jeff Lynne, Roy Wood, The Move, The Idle Race, 'Brum Beat', The Beatles and related artistes. Sorry to hear Pete Johnson is leaving. I'm sure Pete Smith will fill the gap very admirably though.